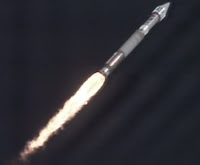 Apogee Motor Firing #4, a 50-minute burn using the ACS thrusters, was performed successfully on Friday. Our perigee altitude is now greater than 10,000 km as it continues to move away from the Earth toward a circular GEO orbit. The Slosh Tiger Team is recommending some tweaking to the ACS controller to allow main engine burns to resume. We are meeting today to discuss a "hybrid" burn for Sunday, 40 minutes on the ACS thrusters, followed by a 10-minute main engine burn. Now that perigee is moving above the inner radiation belt it looks like EVE will no longer to able to measure trapped energetic protons and will have to wait for a solar signal. I hope these proton measurements can be used to improve our models of the inner radiation belt, especially AP8MIN, for the conditions present during this extended solar minimum period. That's what Living With a Star is all about! Thursday on SDO: HMI & AIA completed their initial mechanism checkouts. Every instrument mechanism was moved in both directions. With the initial checkout complete HMI began their mechanism functional tests and completed testing the shutter mechanisms. The remainder of the HMI and AIA functional mechanism tests are scheduled for Saturday. EVE powered on their CCD survival patch heater. SDO operated its ACS Science Control Mode for the first time on Thursday. In "science mode" the spacecraft uses AIA Guide Telescope signals for fine sun-pointing control. SDO stayed in science mode for more than an hour after which it was commanded back to inertial mode. Science mode worked very well. HMI powered on its filter oven on Thursday. This oven keeps many of the optical elements at a constant temperature to allow the spectral scanning of the Fe 6173 line. While the EVE team continues to be busy with instrument commissioning, there is another task at hand that is critical to the success of the EVE instrument. This is preparing the first of five calibration sounding rockets that is set to launch May 5 from White Sands Missile range outside of Las Cruces, New Mexico. This sounding rocket caries an almost exact replica EVE instrument as the satellite version SDO EVE instrument. This sounding rocket, and the four that will follow over the prime SDO mission, will help determine any long-term degradation of the EVE optical system that may occur to help EVE obtain the most accurate measurements possible of the solar irradiance. The picture shows the EVE calibration rocket in the rocket lab at the University of Colorado. The ESP channel can be seen on the left side, then the black optical cavities for MEGS B, A, and SAM channels continuing from left to right, respectively. 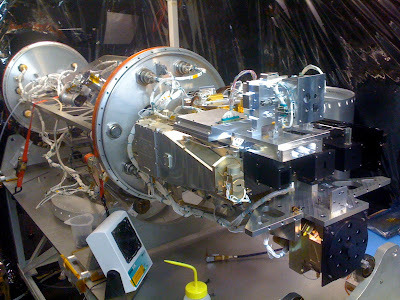 Also seen in this payload is the prototype GOES R+ series X-ray Sensor (XRS) on top of the EVE optical package, and the prototype X-ray Photometer System (XPS) below EVE, both of which will help validate the rocket and SDO EVE measurements. Apogee Motor Firing #3, a 50-minute burn using the ACS thrusters, completed this evening with no issues. The waves created by the SDO Launch are the Astronomy Picture of the Day for February 23, 2010. You can see the sundog on the right side of the picture and the rocket in the middle. A Great Day for Instruments! HMI powered on the Image Stabilization System and both cameras. The operational heaters set points were increased from 10C to 15C and are controlling the instrument temperature nicely. The instrument is responding nominally. AIA went from a minimal power state to being fully powered. This primarily meant powering up the Camera Electronic Boxes and the ISSs. With the ISSs powered up one is now able to see Guide Telescope signals, which indicate that the GTs are quite healthy and relatively aligned with one another. The thermal control system is appropriately controlling the AIA thermal environment. Over the next few days the temperatures will be increased to aid in outgassing. EVE completed their scheduled commissioning procedures without errors. These procedures verified EVE autonomy rule functionality, EVE diagnostic channel packet receipt, all 4 filter wheels are functioning nominally and EVE instrument notification commands. Orbit circularization maneuver AMF #2B, using the ACS thrusters, was accomplished successfully tonight. The burn was 50 minutes long (as designed), and all hardware and software performed as expected. There is now quite a bit more data for the continuing fuel slosh analysis, and the perigee has been increased by approximately 1500 km. The data collected on this burn will be used to refine our understanding of the fuel slosh dynamics with the goal of returning to main engine burns as soon as we can. But until such an understanding is reached, we will continue with orbit circularization maneuvers using the ACS thrusters. The second Apogee Motor Firing (AMF #2) this evening was autonomously aborted after 30 seconds due to high system momentum. The Observatory is safe, the on-board system detected an unexpectedly high momentum, aborted the burn, and returned the Observatory to sun-pointing. Preliminary investigations do not show any indication of a hardware problem, more likely is that the combination of the settling burn (with the ACS thrusters prior to the main engine firing) immediately followed by the initial main engine burn exceeded the limits that were set (i.e. limits were set too low given this particular timing and fuel tank fill conditions). The plan is to continue reviewing the data to confirm the theory. If all holds, the next AMF burn would be scheduled for Sunday evening. February 17, 2010: SDO completed the first of 9 main engine burns that will raise the spacecraft into its final geosynchronous orbit. February 18, 2010: Last week, on Feb. 11th, the Solar Dynamics Observatory (SDO) lifted off from Cape Canaveral on a five-year mission to study the sun. Researchers have called the advanced spacecraft the "crown jewel" of NASA's heliophysics fleet. SDO will beam back IMAX-quality images of solar explosions and peer beneath the stellar surface to see the sun's magnetic dynamo in action. SDO is designed to amaze—and it got off to a good start. "The observatory did something amazing before it even left the atmosphere," says SDO project scientist Dean Pesnell of the Goddard Space Flight Center. 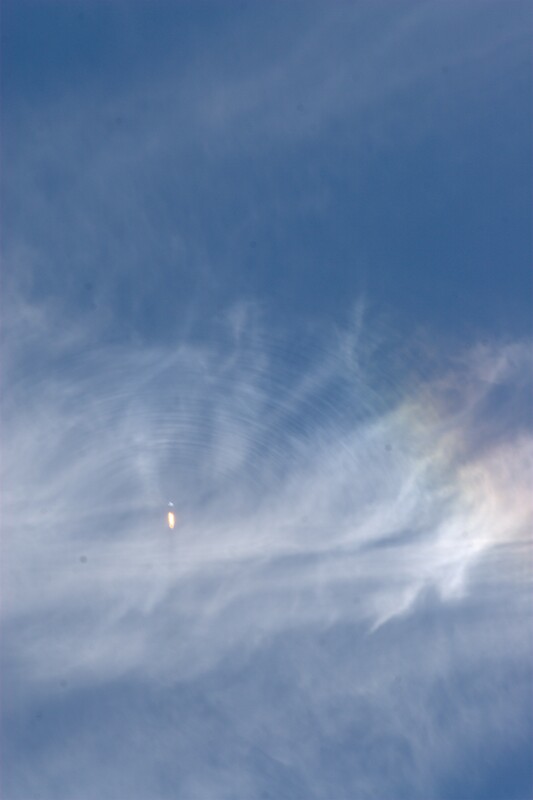 Moments after launch, SDO's Atlas V rocket flew past a sundog hanging suspended in the blue Florida sky and, with a rippling flurry of shock waves, destroyed it. Click on the image below to launch a video recorded by 13-year-old Anna Herbst at NASA's Banana River viewing site—and don't forget to turn up the volume to hear the reaction of the crowd. Shortly after separation, the team confirmed the spacecraft's solar arrays deployed correctly and are generating power. All the crucial post-separation events "happened like clockwork," said NASA Launch Director Omar Baez. This concludes live coverage of the countdown and liftoff of the Atlas V rocket carrying the Solar Dynamics Observatory. For further mission information, please visit http://www.nasa.gov/sdo . Thanks for joining us! Now one hour and 46 minutes into the flight of the Solar Dynamics Observatory, the Centaur's main engine has completed its second and final burn. The vehicle is moving to spacecraft separation attitude. The spacecraft will separate from the Centaur momentarily. NASA's Solar Dynamics Observatory is on its own in Earth orbit after a perfect liftoff from Cape Canaveral Air Force Station in Florida at 10:23 a.m. The spacecraft separated from the Centaur upper stage right on time. The Centaur's RL10 main engine reignited on time at 12:05 p.m. for a three-minute burn. The Solar Dynamics Observatory spacecraft will separate from the Centaur about three minutes after the second main engine cutoff. The Centaur's main engine cut off on time, ending its first burn. Centaur and spacecraft are in a parking orbit, entering a coast phase scheduled to last about an hour and 27 minutes. After a spectacular on-time liftoff at 10:23 a.m. and a flawless ride into space, the Solar Dynamics Observatory spacecraft remains attached to the Centaur upper stage in a parking orbit. The Centaur's main engine will burn once more to position the spacecraft for separation. That second burn is expected at approximately 12:05 p.m.
At the time of the Centaur main engine's second burn, known as MES2, the vehicle and spacecraft will be high above the Pacific Ocean northeast of Australia. The burn is expected one hour and 42 minutes into the flight. Data picked up by the Tracking and Data Relay Satellite System indicates a healthy SDO spacecraft and a healthy Centaur. The Centaur has stopped its slow thermal-control roll in advance of its second main engine burn, now about three minutes away. The Atlas V carrying the SDO spacecraft is shaking the Space Coast as it goes supersonic, passing the area of maximum aerodynamic pressure known as Max Q. Everything looks good on the vehicle. The Atlas V booster has completed its burn and separated from the Centaur upper stage. The Centaur main engine is burning now at 22,300 pounds of thrust; it will propel the SDO spacecraft through the rest of its flight into space. At the top of the rocket, the payload fairing has opened and fallen free, exposing the spacecraft to the space environment. The flight is going very smoothly. Data is coming in from the Antigua tracking station and so far the flight is going very well, exactly as expected. Antigua has lost tracking data as the vehicle and spacecraft travel out of range. All the vehicle's systems continue to perform as expected as the Tracking and Data Relay Satellite System tracks the flight. The Atlas propellant tanks are being brought up to flight pressure and the flight termination system is on internal power. Liftoff is one minute away. Liftoff of NASA's Newest Solar Observatory! NASA's Solar Dynamics Observatory is on its way into space, seeking a vantage point in orbit where it will examine our sun in more detail than ever before. The Atlas V carrying the SDO spacecraft is thundering into the Florida sky on 863,000 pounds of thrust. The booster's RD-180 engine will burn for about four minutes before the booster burns out and separates from the Centaur upper stage. The Solar Dynamics Observatory spacecraft is switching to internal power, signaling that launch is on schedule for 10:23 a.m.
NASA Launch Director Omar Baez has polled his team and everyone reports they're ready to proceed with the countdown. We're now four minutes away from liftoff of the Atlas V rocket with NASA's Solar Dynamics Observatory! The sky is clearing above Launch Complex 41 and winds are below limits. Stand by for liftoff. Range Safety has completed their final set of communication checks between range antennas and the Atlas V vehicle. That's the communication loop the rocket's flight termination system would use to destroy the rocket if it veered dangerously off course. Winds have increased a bit, occasionally bumping up above the 20-knot limit, which is exactly what forecasters predicted might happen. We're still expected to find a time during the launch window when winds stay within limits. We're about half an hour away from the opening of today's launch window at 10:23 a.m. The countdown continues to go very smoothly, with winds and clouds the only topics of concern. Winds are hovering near the 20-knot limit, occasionally gusting above it, but generally staying below it. An area of clouds moving east across Central Florida is believed to be thin enough not to impact launch, but a weather aircraft is monitoring it and relaying data back to forecasters with the 45th Weather Squadron. Launch Weather Officer Clay Flinn just briefed the launch team on the latest weather conditions. Clouds passing over the pad right now are not thick enough to violate the launch commit criteria, and Flinn predicts we'll be "green" for that thick cloud rule for at least another 45 minutes, well into today's launch window. Winds are 15 knots, gusting to 18, although isolated gusts above 20 knots are possible. Countdown clocks are holding at T-4 minutes for 10 minutes. This hold may be extended if the launch team chooses to target a launch time later in the launch window. All Atlas V and Centaur propellants are at flight level. The Solar Dynamics Observatory's Atmospheric Imaging Assembly will allow scientists to see the entire disc of the sun in very high resolution -- 4,096 by 4,096 millimeter charge-coupled device, or CCD. The light-sensitive CCD stores image data and converts it to color. In comparison, a standard digital camera uses a 7.176 by 5.329 millimeter CCD sensor. About half of the Centaur's liquid hydrogen has been loaded aboard. There are about 40 minutes left in the Atlas V/Centaur tanking process. The countdown clock is at T-47 minutes and counting. Our next hold -- and the final planned hold for today -- will begin at T-4 minutes at 10:09 a.m.
At T-37 minutes and counting, the Atlas V booster's liquid oxygen level has reached 97.5 percent, and topping is under way. The Centaur upper stage's liquid oxygen level has reached 95 percent. At this point, the "topping" process will pump small amounts of the propellant into the tank to replace any that evaporates during the rest of the countdown. Winds are staying below the 20-knot limit, and launch managers are cautiously optimistic the weather and wind will stay "green" for liftoff at 10:23 a.m. The area of clouds approaching from the west is expected to reach the launch area around launch time, but forecasters believe the clouds are too thin to pose a problem. A weather aircraft is going to fly into the clouds soon, providing more conclusive information. The liquid oxygen level on the Atlas V booster just passed 30 percent. The Solar Dynamics Observatory test team reports there are no problems with the spacecraft, and with the exception of the switch to internal power, SDO is ready to fly. The spacecraft will change to internal power after launch managers commit to a launch time. Right now, the team continues to aim for the opening of today's launch window at 10:23 a.m. The team is beginning to load 12,680 gallons of liquid hydrogen into the Centaur upper stage. Atlas V liquid oxygen loading just passed 50 percent. Although winds are marginal and occasionally gusting above the limit, the overall trend is much better than yesterday's. An area of clouds has appeared off to the west, and a weather aircraft will fly out and take a closer look at the clouds' thickness and temperature. Launch managers will decide about five minutes before launch -- the last minute of the T-4 minute hold -- whether to commit to launch at 10:23 a.m. If they decide to wait until further in the window, due to wind or another issue, they will stay in the T-4 minute hold and the spacecraft will remain on external power until the decision is made to come out of the hold. At T-96 minutes and counting, the Centaur upper stage liquid oxygen loading just passed 30 percent. Atlas liquid oxygen tanking will begin in about five minutes. Atlas V chilldown is complete and the team is beginning to load liquid oxygen into the booster. The Eastern Range is "green," or "go," on all counts and there are no problems in work. It's a very quiet countdown at this point. The liquid oxygen level aboard the Centaur upper stage is at 80 percent, and the hardware that will be used during the upcoming liquid hydrogen load is being chilled. Built by United Launch Alliance, the 191-foot-tall Atlas V-401 rocket that will boost SDO into space is composed of the orange booster stage topped by the Centaur upper stage. The spacecraft is mounted inside the protective payload fairing above the upper stage. The next major countdown milestone is the start of the "tanking" process, when storage tanks in the rocket's booster stage and upper stage are filled with propellants. The booster's RD-180 main engine runs on a combination of liquid oxygen and Rocket Propellant-1 fuel, a refined kerosene usually referred to as RP-1. The Centaur's RL10 engine is powered by liquid oxygen and liquid hydrogen. The Solar Dynamics Observatory will rely on three advanced science instruments to meet the mission's goals. The Atmospheric Imaging Assembly, an array of four telescopes, will observe the solar surface and atmosphere. 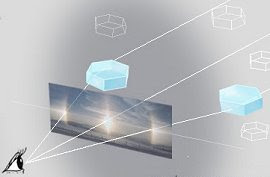 The Extreme Ultraviolet Variability Experiment will measure changes in the amount of ultraviolet light the sun emits. Finally, the Helioseismic and Magnetic Imager will create maps of the sun's magnetic fields and look past the sun's surface. The launch team is ready to begin filling the rocket's propellant tanks with cryogenic liquid oxygen and liquid hydrogen. The booster's RP-1 tank is already loaded. Tanking will begin with "chilldown," which cools and conditions the ground equipment and transfer lines that will come in contact with these extremely cold propellants. The 10-foot-wide, 41.5-foot-tall Centaur upper stage will be filled with 4,150 gallons of liquid oxygen and 12,680 gallons of liquid hydrogen; the Atlas V booster's propellant tanks hold 48,860 gallons of liquid oxygen and 25,540 gallons of RP-1. The countdown will pick up once again at 8:13 a.m. as we come out of the T-2 hour hold. Countdown clocks are ticking backward once more as the T-2 hour hold comes to an end. Today's countdown continues to go smoothly, with no technical issues reported. A few miles south of the launch pad, launch managers and controllers are monitoring the countdown from their consoles inside the Atlas Spaceflight Operations Center. The blog console is located inside the nearby Launch Vehicle Data Center, where we're listening to the launch team's communication channels along with launch support personnel. Launch Weather Officer Clay Flinn just briefed NASA Launch Manager Omar Baez and the rest of the launch team about today's weather forecast. There's no threat of clouds or precipitation interfering with today's liftoff, and although winds are gusting to the 20-knot limit, "by the front of the window, we should be in decent shape," Flinn said. It's a chilly morning at Florida's spaceport, with temperatures expected to rise into the lower 40s during the countdown. In the event of another scrub today, weather on Friday will be considerably worse, with rain in the forecast. Weather on Saturday would be better, although winds would remain a problem. At T-130 minutes and counting, the launch pad is being cleared to prepare for loading of extremely cold, or cryogenic, propellants. The Eastern Range has completed its check of the hold-fire system that would allow range personnel to stop launch for safety reasons. Our nearest star is the dominating force behind Earth's climate -- and space weather throughout the solar system. Powerful solar flares, fierce coronal mass ejections and other intense solar events can disrupt communications and power systems on Earth, and threaten astronauts living and working outside the relative protection of our atmosphere. The Solar Dynamics Observatory is embarking on a five-year mission to investigate -- in unprecedented detail -- the energy processes driving the sun's stormy activity. The 6,555-pound spacecraft will return 1.5 terabytes of data every day -- equal to half a million downloaded songs -- and provide detailed images of near-IMAX-quality high resolution. The mission is the first of NASA's Living With a Star Program. Countdown clocks across Cape Canaveral Air Force Station have paused at T-2 hours for a 30-minute built-in hold. The countdown will resume at 8:13 a.m.
Today's live coverage of the launch of Solar Dynamics Observatory will begin at 7:15 a.m. EST. Welcome once again to the launch countdown for NASA's Solar Dynamics Observatory aboard a United Launch Alliance Atlas V rocket. The launch team hasn't encountered any problems that would prevent liftoff at 10:23 a.m. EST from Cape Canaveral Air Force Station in Florida. Today's main concern will be the weather. Winds are likely to be close to the 20-knot limit, but lower than yesterday's launch attempt, when winds exceeded limits throughout the countdown and ultimately scrubbed the liftoff. The forecast for today is better, with 45th Weather Squadron forecasters predicting a 60 percent chance of weather favorable for launch. Launch Weather Officer Clay Flinn will provide a detailed weather briefing in just a few minutes, so we'll share that information with you. Join us on launch day and follow the action as the clock ticks toward liftoff of NASA's Solar Dynamics Observatory aboard an Atlas V rocket. The Atlas V roared to life Thursday morning to send the Solar Dynamics Observatory into space on its mission to evaluate the complex mechanisms of the sun. Liftoff came on-time at 10:23 a.m. EST from Launch pad 41 at Cape Canaveral Air Force Station on Florida's Atlantic Coast. The SDO spacecraft is in good shape midway through the launch phase that will eventually place it in an elongated orbit reaching more than 21,000 miles high. Eventually, SDO's orbit will be circularized and will reach about 22,300 miles in what is called geosynchronous orbit. From that altitude, the spacecraft will point its instruments at the sun and relay the readings instantly to a ground station in New Mexico. The research is expected to reveal the sun's inner workings by constantly taking high resolution images of the sun, collecting readings from inside the sun and measuring its magnetic field activity. This data is expected to give researchers the insight they need to eventually predict solar storms and other activity on the sun that can affect spacecraft in orbit, astronauts on the International Space Station and electronic and other systems on Earth. Live coverage of the launch is available on NASA TV and NASA's Launch Blog. The February 10, 2010 scheduled launch of the Solar Dynamics Observatory (SDO) has been scrubbed due to high winds. The launch is rescheduled for February 11, 2010 at 10:23 am. The launch has been rescheduled for at least a day. The new scheduled launch will be on Wednesday February 10, 2010 at 10:30. All the guest activities will be moved to Tuesday. The reception will stay on Monday. With its Solar Dynamics Observatory (SDO), NASA will probe the Sun in greater detail than ever before and, with luck, begin to answer some of its biggest mysteries. Despite being our planet's nearest star, the Sun can still perplex scientists, who don't understand much of its behavior and its effects on our weather system. NASA plans to launch a satellite February 9 that will gather more data than ever before about the Sun and — scientists hope — begin to provide answers. Taking off on an Atlas V rocket, the Solar Dynamics Observatory (SDO) will observe the Sun's atmosphere and inner workings with more precision than ever before, including collecting 60 images a minute with 10 times the resolution of high-definition television. It will be the first mission of NASA's Living With a Star Program. "SDO will take full-disk, high-definition images of the Sun all of the time," says project manager Liz Citrin at NASA's Goddard Space Flight Center in Greenbelt, Maryland. "These advances will provide the data to better understand how the Sun works and will allow us to develop the tools to predict its behavior."